A TAT Newsroom Contest 2014 photo entry by Narin Sapaisarn. Bangkok, – The Tourism Authority of Thailand (TAT) is inviting tourists and locals to observe the colourful festival of Khao Phansa Day, marking the start of Buddhist Lent, which this year is being celebrated on 9 July, in unique Thai local ways nationwide. Khao Phansa Day, known as vassavasa takes place on the day after the full moon of the eighth lunar month (July). The celebrations in Thailand give visitors a unique insight into the culture of the area in which they are held. In Saraburi, for example, local flowers are donated to monks as a way of making merit while in Phra Nakhon Si Ayutthaya, candles are paraded on boats to celebrate the canal and boat life of the old Thai capital. 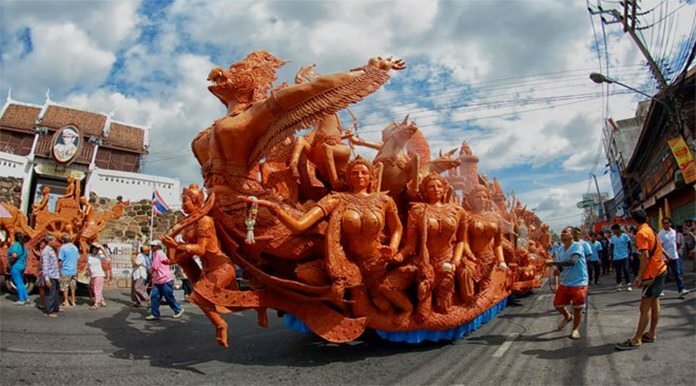 In Ubon Ratchathani, the International Wax Candle Festival and Wax Candle Procession celebrates the tradition of carving wax images and candles with teams coming from all over the world to compete in a wax sculpture competition. Khao Phansa is also the day when traditionally monks would go to the temples and stay there for three months of meditation and study. Their need for candlelight – as there were no electricity in the old days – during this time led to a tradition of carving amazing wax effigies and sculptures, which now play a big role in the celebrations. As well as the processions of exquisitely carved candles and wax displays, Khao Phansa Day is celebrated with parades, folk dancing in traditional costumes, music and storytelling. As the three-month period of Buddhist Lent is observed as a time of abstinence from drinking and eating to excess, people often see Khao Phansa Day as the last chance to indulge in their favourite local snacks and dishes. So many celebrations will have food fairs and booths selling local specialties. This makes the festival a great time to explore the unique culinary offerings of each district.